Windows Tablets Delay: Disaster or Shrewd Move? This time next year Steve Jobs may take to the stage and introduce the iPad 3, while Microsoft is still working on a tablet-tailored Windows, according to a Bloomberg report. A few months after, though, Microsoft will release a tablet-friendly version of Windows in time for the 2012 back-to-school season, according to the report's unnamed sources. One year into the tablet revolution, Microsoft still does not have a viable tablet operating system optimized for touch use. The company is only catching up in the smartphone area with Windows Phone 7, which is already late to the party started in 2007 by the original iPhone. 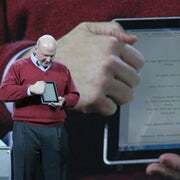 Now, with a second iPad on the market, as well as strong upcoming competition from Android and other tablet manufacturers, Microsoft could wait itself out of the game by autumn 2012. By 2012, we would also probably see the iPad 3, as well as some new iteration of Android and WebOS tablets. If Microsoft needs more than a year and a half to come up with a decent alternative tablet OS, there's no guarantee people who already bought into Apple's or Google's ecosystem would go back to Microsoft's solutions. Microsoft announced in January that its next-generation Windows 8 operating system will work not only on traditional x86 processors but also on ARM architectures like the ones used in tablets. The new ARM-based systems will be part of a trend toward "System on a Chip" architectures that merge CPU, graphics processing units, memory, and input/output functions for improved reliability, lower power consumption and applicability across a wider variety of devices. Additionally, Microsoft said it plans to keep Windows Phone 7 as a separate OS for smartphones, while Windows will power all other devices.